It’s Tuesday afternoon, and Zodiak the pet therapy dog is strutting down the main hallway of Pavilion B at the Jewish General Hospital. Alongside his owner, Véronique Binette, he’s heading to Geriatrics to play tug-of-war with a patient they see regularly. However, before long, passersby recognize his bright brown eyes and open-mouthed grin. Jessica Napper (left) and Maya Tal, X-Ray Technologists in the MRI area of the JGH, pause to play with Zodiak. “Hi Zodiak!” Éric Lasala, an orderly, calls out as he opens his arms to the Alaskan Malamute. As he leans in to pet the long, coarse, black and white fur, the dog’s tail wags with excitement. Under the florescent lights, his coat glistens. “Wow, he’s gorgeous,” Mr. Lasala remarks. Zodiak is a rather large dog—his back rises just above an average person’s knees—but despite his imposing stature, his temperament is calm and he’s more likely to whimper or coo, rather than bark. 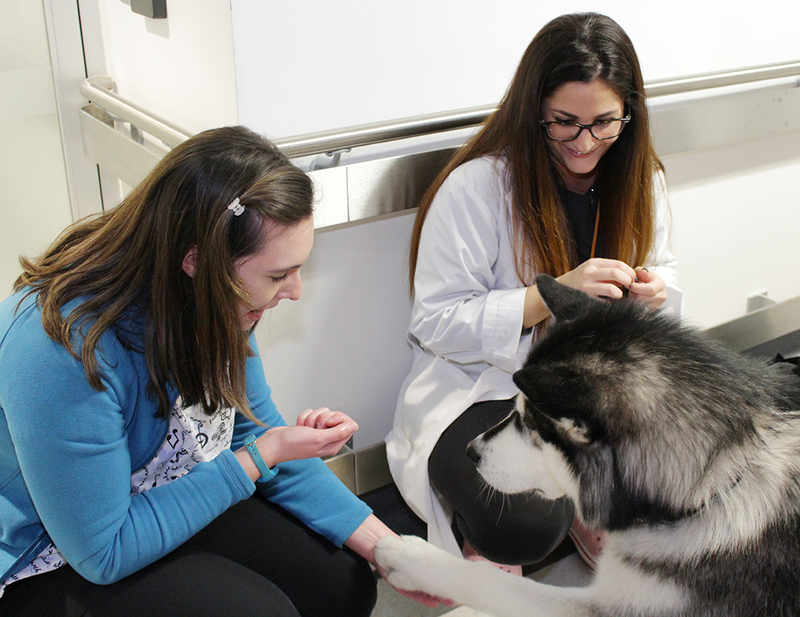 Since summer 2018, Zodiak and Ms. Binette have been volunteers in the Pet Therapy Program of CIUSSS West-Central Montreal, which enables staff and patients to pet, cuddle and play with dogs on a weekly basis. Interaction with animals has been shown to reap emotional and physical benefits, from decreasing feelings of isolation and anxiety to lowering blood pressure. 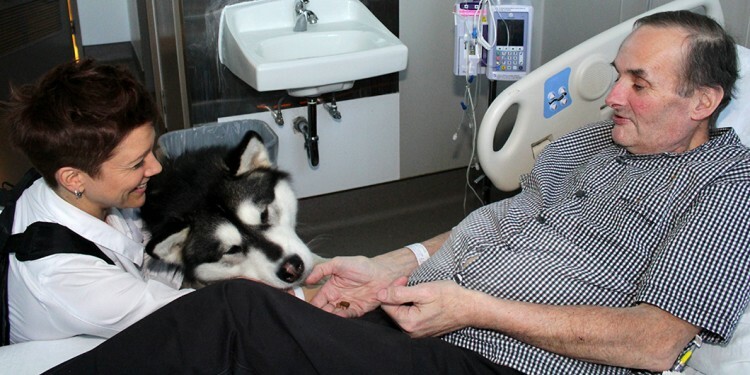 “The animals are here to bring joy and a sense of calmness that you may not always find in a healthcare setting,” says Joanne Laing, the CIUSSS’s Chief of Volunteer, Therapeutic Recreation and Chaplaincy Services. 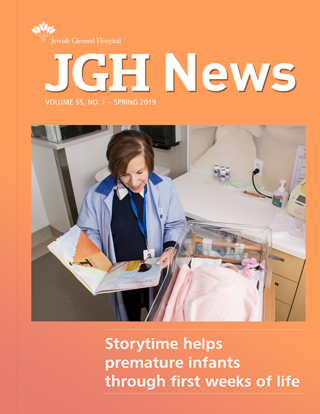 The JGH is home away from home to four canine volunteers: Zodiak, Bentley, Monty and Sergeant Pepper, each accompanied by their respective owners, who take shifts depending on their availability. Ms. Binette and Zodiak, for example, visit the hospital at least once weekly, often for two hours on Tuesdays. Typically, they head to Geriatrics, but Ms. Laing sometimes directs them to specific floors. 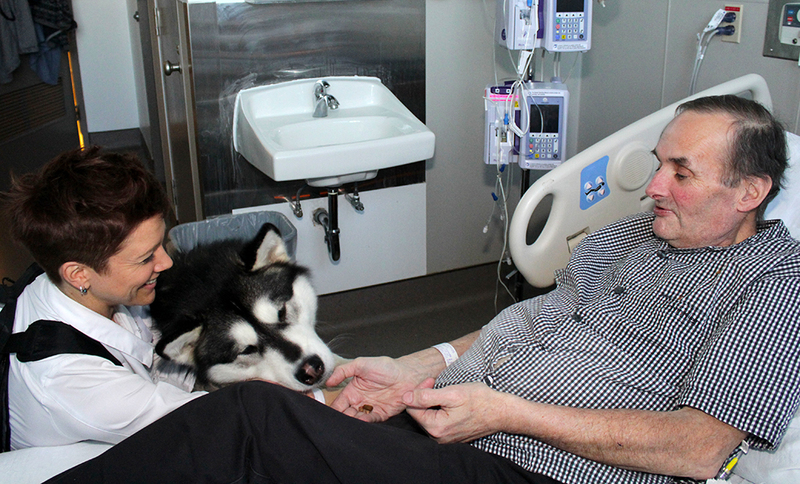 Patients and staff can also request a visit from a dog. After 20 minutes of cuddles from passerby, dog and owner arrive in Geriatrics. Before entering a patient’s room, Ms. Binette gently knocks and asks for permission to enter. If the patient is sleeping, tired or simply not in the mood for company, she moves on. But some patients are always up for a visit, like Richard Auclair, who’s been at the JGH for over a year. “Bonjour, Richard, can I come in?” asks Ms. Binette. “It’s Vee. I’m here with Zodiak.” Within seconds, Mr. Auclair is sitting up in bed, his smiling face aglow. “It’s a real treat to have such a beautiful dog come in for a visit,” he says as he pets Zodiak. “It just lifts my spirit.” Ms. Binette hands him a toy, and Zodiak gently tugs on it, as he pulls the opposite end. To be eligible for the Pet Therapy Program, a volunteer must own a dog that’s suited for what is known as “zoo animation”, a term that describes the use of an animal, usually a dog, to elicit positive emotions in people through interaction. Pet owners who use their animals for zoo animation or zoo therapy need to insure their furry friend, in case of injury or other problem. Since insurance is costly, especially for a volunteer, Ms. Binette has started a GoFundMe page, where she is accepting donations to enable Zodiak to continue bringing smiles to the people he meets at the JGH. The owner does not need to be a trained zoo therapist who, by comparison, develops long-term therapeutic objectives for a patient alongside other medical professionals. In both cases, the dog must have a calm and gentle temperament, be obedient and be easy to train. Layane Duarte, a JGH visitor, takes a moment to play with Zodiak. However, patients—in Pavilion K or elsewhere—can opt to have their own pet visit them. All they need to do is fill out a form attesting to the fact that the animal is properly vaccinated and in good health. “So many people have asked to bring in their pets that we’re now leaving the forms with the nurses on the units in Pavilion K,” says Ms. Laing. The Pet Therapy program is also offered at Donald Berman Jewish Eldercare Centre and Donald Berman Maimonides Geriatric Centre, and Ms. Laing is working on expanding it to other long-term care sites. Whether participants pet, play ball, give treats or take selfies with the pet therapy dogs, they always leave with a smile. 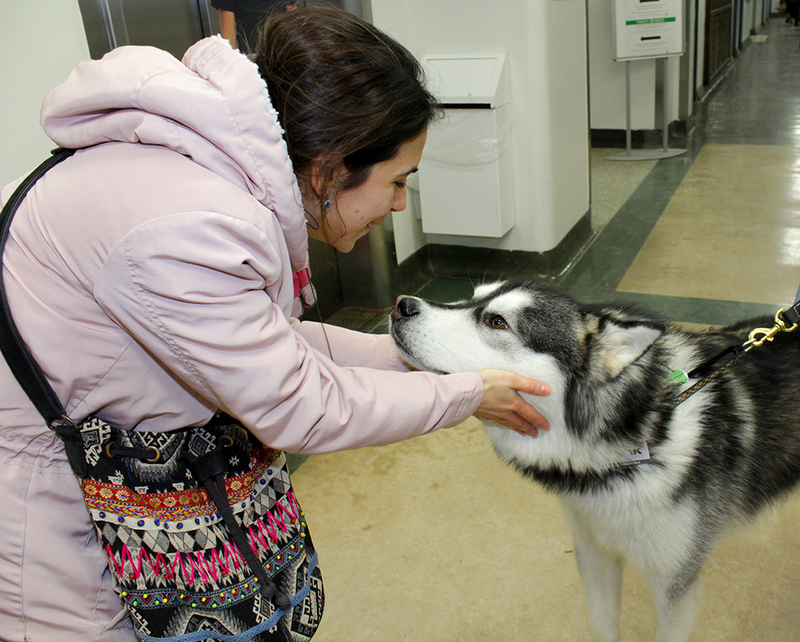 “It’s really special to see the connection between the patients and the dogs that come to the psychiatry unit,” says Chesley Walsh, Coordinator of the Volunteers in Partnership Program.